Den Of Geek Compiles The Top 50 Movie Special Effects Shots | OhGizmo! Overall it’s a pretty solid list, though there are some odd exemptions. I’m no fan of The Lord of the Rings trilogy, but there were a handful of shots created with Weta’s Massive software that were pretty impressive. And Davy Jones from Pirates of the Caribbean: Dead Man’s Chest was the first time I was ever actually fooled by CGI, since I assumed at least part of his face was prosthetic makeup. 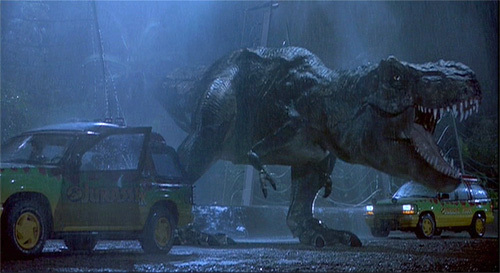 But I do agree with their #1 choice, which is a shot from the T-Rex attack on the tour vehicles in Jurassic Park. For a film that’s over 15 years old and featured some of the first living, breathing CGI creatures, it’s amazing that the visual effects are still better than what’s seen in many summer blockbusters today. There's alot on that list I'd agree with and even more I'd disagree with. Most notable is “Bullet Time” from The Matrix ,that almost every action movie copies now. The one you mentioned.. Wetas Massive, the huge battle scene from Return of the King was amazing…and Gollum. Wow that is one gem of a compilation. I agree with the great effects done on Hannibal, The Day After Tomorrow, Transformers, and Gladiator. Jurassic Park is indeed one of the best and may have perhaps set the bar as well for any future works that intends to tackle the same subject. There's a lot mentioned there that I haven't got the chance to watch and they are now in my must see flicks for 2009. Cheers!